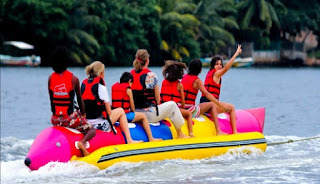 There are many water sports Centre’s around Sri Lanka, and many P.A.D.I. recognized operators. The warm waters - 27°C/80°F – around Sri Lanka’s coast encourage wonderful surfing, diving and snorkeling. The calmer inland waters offer windsurfing, water skiing, dinghy sailing and jet skis. The Best time at the East Coast is during April to September; while the South & West Coast is November to April. Bentota is the water-sports capital of Sri Lanka. Swimming, body-surfing, diving in the sea, jet-ski, windsurf, parasail, and water-skiing. Many water sports Centre’s are equipped with jet skis, water skis, surf boards, speed boats and much more. Sunshine Water Sports Center is a local operator that is right on the riverfront. This water sport center lies directly on the Bentota River, in Aluthgama, 60 km from International Airport and Few km from your Hotels, resorts or villas between Beruwela and Bentota. They provide the following activities Windsurfing, Surfing, Waterskiing, Wakeboarding, body boarding, banana ride, tube ride, jet-ski, Deep Sea Fishing, River Fishing, Snorkeling, diving and river cruises. Deep sea fishing, snorkeling, and diving are available from the month of November to April as the sea condition are good at that time. The other activities are available all year long as they are done on the river. Hikkaduwa located on the south western coast is one of the best locations for surfing. Hikkaduwa boasts four places you could surf during the season. Kalpitiya, located about 95 km from Colombo, this sandy peninsula with the Indian Ocean on one side and the Kalpitiya lagoon on the others offers a covered heaven for kite surfers. You can either carry your own gear or hire from the local club at an hourly rate. Arugambay is situated in the Eastern seaboard of Sri Lanka and is regarded as one of the 10 best surfing destinations of the world, thus also making it an ideal place to learn surfing.